My classic Weekend Warrior Style. Image c/o google images. It is 1:03 am on Saturday morning and I have declared at least for this weekend I will be a warrior. I will get things done. I will ‘let go’ and tackle my self imposed to do list. 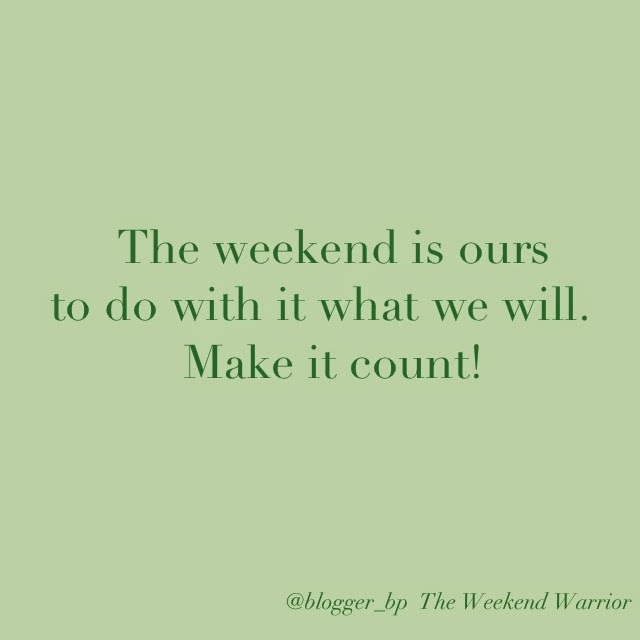 What will this weekend warrior do? Nothing special, but here are the four things I will be working on Saturday and Sunday. Let’s see where I am come Monday morning. Apologize to Toffifay. This little penguin is my travelling mascot. The hubby and I found him a few years ago prior to our trip to Spain, maybe earlier. Tired of hearing from family, “Why do you just take pictures of sites on vacation? How do we know it’s really you taking them?” Enter Toffifay, our funny fluffy pocket sized penguin. If he is in the picture, then you know one of us was taking it. Toffifay likes to travel and he likes to be a part of the action. During my recent trip to Manila, Toffifay primarily stayed in my closet, bored out of his wits. I just didn’t think to take him here there and everywhere. He’s been to Manila a lot. A LOT. He came with me to an impromptu brunch hosted by an old high school classmate in the midst of a power failure (thank you, Typhoon Glenda) and after that, I just thought my baby should stay home. He has shot me some dirty looks though while unpacking here in San Francisco. Sitting on my dining table as I empty out my suitcases I know he is pretty annoyed that I had to drag him halfway around the world just to sit in my closet. So I am sorry, Toffifay. I will make it up to you. Work on details for my upcoming event. I am super psyched to be hosting Happy Mail Happy Hour on August 14. My complete brainchild, this event is a small gathering of paper lovers and snail mail senders like me to talk stationery obsessions and write mail together over some bites and drinks on a Thursday night. My friend, Jamaica, from JamaRoo Kids Studio is graciously letting us use her fantastic space in Lower Pac Heights for the shindig while some of my favorite stationers/ small biz owners including Egg Press, Rock Scissor Paper, Julie Ann Art, Ink and Smog Editions, b-spired, Pennie Post, Mint Chip Ink, and The Union Street Papery are going to sweeten the stationery stashes of lucky card hoarding guests (yes, we are card hoarders as well as mail senders – own it). Is this your jam? It will be great to see you there, especially if we haven’t met yet! Get my mind and body back on track. The jet lag, my diet, my dehydration, my lack of exercise … it is all hurting my thirty something bones. My trip home was incredibly healing and enjoyable, but it was rough on my body, and I can’t take my health for granted. I feel better when I take care of myself. Gym, market, cook, rest, work schedule. I am ready for you! Make some kind of plan for my birthday. I am a Virgo, which means not only is my birthday coming up, but I usually like it to be celebrated in a pretty specific way every year. It’s a bit of pressure, when reaching one of those milestone birthdays, so I am even more conscious of keeping it simple (but exciting). Any suggestions? Have at it, my friends! The weekend is ours to do with it what we will! Make it count! Hi Caity! Yes, lil Toffifay has kicked his jetlag & ready to rock again! Thank you for the well wishes regarding the event! How GREAT if you could come!!!! 😃 thanks for reading!!! Previous PostFrozen … When You Can’t Just "Let It Go"